Throughout the year, public minibuses are leaving daily at 11:30 12:30 13:30 and 15:30. The minivan station is a tour office opposite the Trang train station. It spent around 2 hours to Ko Lanta including arcross two car ferries. The ticket price is 200 B./person. 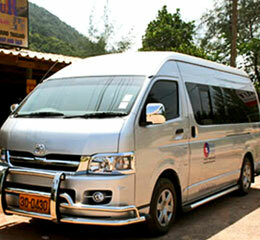 The Minivan from Trang to Ko Lanta.